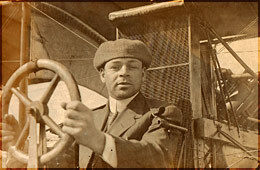 Emory Conrad Malick (1881-1958) was the first licensed African American aviator, earning his International Pilot’s License (Federation Aeronautique Internationale, or F.A.I., license), #105, on March 20, 1912, while attending the Curtiss School of Aviation on North Island, San Diego, California. Mr. Malick was also the first African American pilot to earn his Federal Airline Transport License, #1716, in 1927. But his name is as yet unknown. Eugene Bullard flew for France in 1917, since, as a black American, he wasn’t permitted to fly for his own country during World War I. In 1921, another African American, the famed Bessie Coleman, also had to travel to France to earn her International Pilot’s License, and is credited with being the first black pilot to fly in the United States. James Herman Banning is considered to be the first African American to achieve his pilot’s license in the United States (and was, in fact, the first black pilot to earn a Limited Commercial License, circa 1927); and Charles Alfred “Chief” Anderson, the Chief Flight Instructor for the Tuskegee Airmen, has long been considered to be the first black pilot to earn a Federal Transport License, which he earned in 1932. But, in fact, Emory C. Malick preceded them all. Born on December 29, 1881, Emory grew up in central Pennsylvania, first in Seven Points, then in nearby Sunbury, Northumberland County. According to the U.S. Federal Census, he was living and working as a carpenter in both Lancaster and Philadelphia by the year 1910. On July 24, 1911, Mr. Malick made his first recorded flight in an engine-powered “aeroplane,” which took place in Seven Points. On September 5 and 7, 1912, Emory flew his biplane for a Labor Day celebration near Shamokin, Pennsylvania. In the summer of 1914, he obtained, assembled—and improved upon—his own Curtiss “pusher” biplane, which he flew over Selinsgrove, Pennsylvania, “to the wonderment of all!” thereby becoming the first pilot to soar through the skies of Snyder, in addition to Northumberland, Counties. He also built and flew his own gliders. In the Philadelphia area, Mr. Malick transported passengers for his Flying Dutchman Air Service, and he worked in aerial photography with the Aero Service Corporation and Dallin Aerial Surveys. He was also an airplane mechanic (license #924), as well as a carpenter and master tile-layer. Book One: Lila Discovers her Awesome Great-Great-Great Uncle Emory! 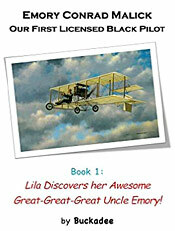 Book Two: Up High in the Sky with Lila and her Great-Great-Great Uncle Emory!